Emergency Toilet or Drain Backups? Call on us 24-hours, every day! Reviews of our Plumbing and Sewer Repair Work! Your home's side sewer line is your main outlet for all your home's wastewater. A clog in the line or any sort of break down of the sewer can cause serious issues for your home and your health in the form of waste "backing up" into your tubs, toilets, and basement drains. If you think you have some sort of sewer line clog or sewer repair issue, call on Plumbing Experts NW. Call on us, even if you're not completely sure what's wrong. We pride ourselves on helping to sleuth-out and give you an accurate diagnosis of the problem. 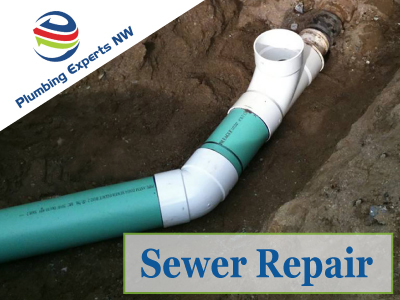 Whether backing up into the house or you have other symptoms, like sewage appearing in your yard, Plumbing Experts NW will give you options for clearing up the situation and/or repairing your sewer line. With sewer cleaning tools for snaking, clearing roots like any rooter service, jetting the line, and using sewer camera technology, we will clear your main drain and find out if there's any kind of a break or complication with the line itself. After clearing your line and getting a look with a sewer camera, we may find that your line is breaking down in a section or having a larger problem requiring sewer repair. This is common with older homes and with sewer repair in Everett, as the sewer line materials of old will eventually break down and collapse or give way to root intrusion. Plumbing Experts NW always presents you with options for immediate repair or to manage the issue in other ways. We offer the sewer repair Everett WA families and friends need because we don't pressure you into decisions. With Plumbing Experts NW, your satisfaction is always guaranteed, so you can feel the peace of mind, even with an unfortunate sewer cleaning or sewer repair need.